Red-eyed tree frogs are among the most beautiful and widely recognized of all living amphibians. Habitat - They prefer lowland rainforest areas close to rivers and hills. Main Prey - flies, crickets, moths, grasshoppers, and sometimes even smaller frogs! Predators - Bats, owls, snakes, tarantulas, toucans, and young alligators. The Red-Eyed Tree Frog (Agalychnis callidryas) is commonly known as the “monkey frog” for its jumping abilities. It is a relatively small amphibian, measuring no more than eight centimeters. The male is usually about two and a half centimeters smaller than the female. A colourful amphibian, it is most recognizable by its bright green color and red eyes. Its other markings include blue and cream coloring around the groin and rib areas as well as its orange feet. However, this color pattern is developed with age; the younger Red-Eyed Tree Frogs are mostly brown. Their lifespan in the wild is usually around five years. Red-Eyed Tree Frogs have many characteristics to accompany their climbing habits. Their long limbs allow them to climb and swim with agility as do the sucker pads on the bottom of each digit. The skin on their stomachs is a lot thinner than the skin found on their backs which is more resistant and thick. They have long sticky tongues to help them latch onto their prey for an easier hunt. During the day, red-eyed tree frogs mostly sleep, keeping their eyes closed to help camouflage themselves. If disturbed, a frog will abruptly reveal his red eyes, startling potential predators. This often gives the frog just enough time to jump away to safety. Red-eyed tree frogs have very strong suction cup toe pads that make them agile climbers. Adult males are only about 5 cm (2 inches) in length while the females tend to be larger at 7.5 cm (3 inches). Males croak and quiver, like a song and a dance, to try to attract females. These frogs change color according to their mood from dark green to a reddish-brown. Their neon-green bodies may play a similar role in thwarting predators. Many of the animals that eat red-eyed tree frogs are nocturnal hunters that use keen eyesight to find prey. The shocking colors of this frog may over-stimulate a predator's eyes, creating a confusing ghost image that remains behind as the frog jumps away. The Red-Eyed Tree Frog is a lot more complex than it seems. It contains a third eye lid called the nictitating membrane. This membrane allows them to shield their eyes from danger while still being able to see. This is useful when in a mating battle or when being hunted. The coloring of their eyes also plays a large part in their survival. The bright red causes their predators to second-guess the prey and stuns them to give the Red-Eyed Tree Frog a chance to escape. The red color also allows them to see at night which is useful since they are nocturnal amphibians. The Red-Eyed Tree Frog has a few other adaptations which help guarantee their survival. Firstly, they are able to hide their blue and cream markings when they sleep so that they camouflage against the leaves for better protection. They also are able to change their colors depending on their mood or environment which offers a more secure lifestyle. The Red-Eyed Tree Frog also prevents itself from dehydration by staying under leaves and keeping its limbs close to its body. Standard all-glass reptile terrariums make ideal enclosures for red-eyed tree frogs. These habitats are easy to clean, available in many different sizes, and retain heat and humidity well. A secure screen top is advisable. This allows for proper ventilation as well as for the proper placement of any necessary light fixtures. An enclosure no smaller than that of a standard 20-gallon terrarium is recommended for these frogs once adult size is achieved. As many as 3 or 4 of these communal frogs will thrive in such an environment. In smaller enclosures the animals may injure themselves if they leap across the cage and hit the enclosure wall. As a tropical species, red-eyed tree frogs should be provided with moderately warm temperatures during the day. Ambient cage temperatures should not exceed the mid-80's, with temperatures between 78 and 84 being optimal. Nighttime temperatures can safely drop into the upper-60's, but slightly warmer nocturnal environments are advised for smaller specimens. In most parts of the country, little or no supplemental heating will be required during the warmer months of the year. However, if the temperatures within the home drop below those recommended above, extra heat will need to be provided. Low wattage heat bulbs and heating pads are ideal, as they provide gentle heat without being overly drying. Red or nocturnal bulbs are excellent choices as they can be left on at night and can provide a 24 hour heat source for the frogs. Specialized full spectrum lighting is not mandatory for these frogs to thrive in captivity, but they can benefit from some low output UVB lighting. Use of these lights not only makes it easier to view the animals, but can be used to help grow and maintain a planted tank in addition to providing UVB for the frogs. The substrate used for red-eyed tree frogs should be one that promotes healthy levels of humidity but also one that is easy to clean and resistant to mold and fungus. Coconut husk products such as EcoEarth, CocoSoft chips, compressed coconut bricks, or coconut chips are all an ideal choice. Other acceptable choices include cypress mulch, orchid bark, and sphagnum moss. Red-eyed tree frogs are arboreal and will require a variety of climbing and hiding structures within their habitat. Branchy sticks, cork flats, cork rounds, and both live and artificial plants should be used to create a comfortable and naturalistic environment for these frogs. When choosing plants (live or plastic), opt for those with large, broad leaves, as these are most similar to those used by the frogs in nature for shelter and sleeping. Additionally, any live plants should be of a species that is tolerant of high heat and humidity, and certain lighting considerations may need to be taken if these plants are to thrive. A large, shallow water dish should always be provided for these animals. While they rarely swim, the large surface area of the water will increase ambient cage humidity and provide an emergency retreat for the frogs should the enclosure become too hot. Humidity levels within the enclosure should be moderate to high. However, the enclosure contents should not be allowed to become soggy. Rather, one should devise a misting schedule that allows the habitat to remain quite moist for a number of hours, and nearly dry prior to being misted again. For the vast majority of situations, spraying the contents of the enclosure (substrate, furnishings, cage walls, etc.) twice daily should be sufficient. Hand spray bottles are fine, but automated misting systems are available for more elaborate set-ups or for when the keeper may be away for an extended period of time. In addition to these, a reptile fogger can be used to increase humidity in a very aesthetically pleasing way. The fog can also act as a cooling system during the warmest summer months. Frogs have historically been an indicator species, evidence of an ecosystem's health or its impending vulnerability. 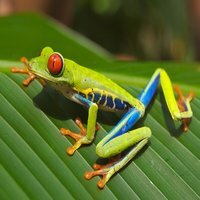 Not surprisingly, the world's amphibian population has experienced a decline in recent years; research indicates that factors include chemical contamination from pesticide use, acid rain, and fertilizers, the introduction of foreign predators, and increased UV-B exposure from a weakened ozone layer that may damage fragile eggs. Though the red-eyed tree frog itself is not endangered, its rainforest home is under constant threat. Like most frogs, red-eyes do not tolerate excessive handling. While they are harmless and can be safely handled for brief periods of time, they should not be acquired as a "hands-on" pet. In addition to being stressful for the animal, frogs have sensitive skin that can easily absorb pathogens or toxins from our hands. Red-eyed tree frogs are carnivores, feeding mostly on insects. They prefer crickets, flies, grasshoppers and moths. Sometimes, they will eat smaller frogs. For tadpoles, fruit flies and pinhead crickets are the meals of choice. Thanks to their big bulging red eyes, it's not hard to recognize red-eyed tree frogs! This alien-like feature is a defense mechanism called "startle coloration." When the frog closes its eyes, its green eyelids help it to blend in with the leafy environment. If the nocturnal frog is approached while asleep during the day, its suddenly open eyes will momentarily paralyze the predator, providing the frog with a few seconds to escape. However, the frogs' eyes are not their only fashion statement! To match the brilliance of their eyes, these frogs have bright lime green bodies that sometimes feature hints of yellow or blue. According to their mood, red-eyed tree frogs can even become a dark green or reddish-brown color. They have white bellies and throats but their sides are blue with white borders and vertical white bars. Their feet are bright red or orange. Adept climbers, red-eyed tree frogs have cup-like footpads that enable them to spend their days clinging to leaves in the rainforest canopy, and their nights hunting for insects and smaller frogs. Male red-eyed tree frogs can grow up to two inches in length and females can grow up to three inches. First identified by herpetologist Edward Cope in the 1860s, the red-eyed tree frog is found in the lowlands and on slopes of Central America and as far north as Mexico. As with other amphibians, red-eyed tree frogs start life as tadpoles in temporary or permanent ponds. As adult frogs, they remain dependent on water to keep their skin moist, staying close to water sources such as rivers found in humid lowland rainforests. Red-eyed tree frogs can be found clinging to branches, tree trunks and even underneath tree leaves. Adults live in the canopy layer of the rainforest, sometimes hiding inside bromeliads. The temperature should be about 78-85° during the day and about any where from 66 to 77° at night. The humidity should be kept around 80-100%. United States of America -Central America / Northern South America.